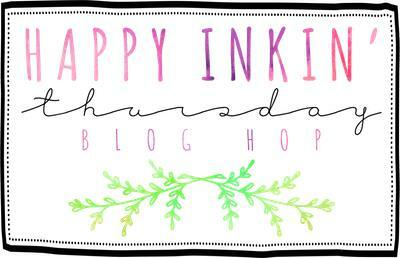 Happy Thursday, y’all – and welcome to another Happy Inkin’ Thursday Blog Hop!! We’re playing with a fun little sketch today – so be sure to check out all the ladies’ projects when you’re done here, won’t you? The middle layer (which is the base for the card front) is Marina Mist – and I embossed it in the Seaside TIEF, then matted it on Whisper White and adhered it to the Marina Mist card base with Fast Fuse. Next up is a piece of the Marina Mist paper from the Sweet Soiree Specialty DSP also matted on Whisper White and adhered to the card front. I made the rainbow by cutting each band with the dies from the Rainbow Builder Framelits. The colors, from the top down, are: Rose Red, Peekaboo Peach, Daffodil Delight, Emerald Envy, Dapper Denim, Sweet Sugarplum and Elegant Eggplant. I adhered each band with Liquid Glue. I cut a bunch of clouds with the cloud dies from Whisper White – then I started building my cloud decks. I adhered the bottom layer with Liquid Glue and then added several more pieces and layers with Stampin’ Dimensionals. The top later is stuck on with Liquid Glue. After I laid down the first cloud layer – I added a Party Panda. I’d stamped him (without his balloon) in Tuxedo Black Memento Ink on Whisper White and fussy cut him. Then I stuck him in amongst the clouds with Liquid Glue. His balloons are punched with the smaller balloon in the Balloon Bouquet Punch. One is cut in Whisper White (and has a little sentiment from Party Pandas in Tuxedo Black Memento Ink). The other two are cut from the Myths & Magic Glimmer 6″ x 6″ Paper – one in Irridescent and one in Turquoise. I adhered them all together with Liquid Glue and then popped the whole bunch on with Stampin’ Dimensionals. The string and bow are Whisper White Solid Baker’s Twine. I stamped the Sunshine & Rainbows sentiment in Marina Mist on a strip of Whisper White and bannerized the end with my Paper Snips. Then I adhered it with some Liquid Glue and Stampin’ Dimensionals. I finished off the card front with a bunch of Glitter & Clear Epoxy Shapes! On the inside, I stamped another of the Party Pandas in Tuxedo Black Memento Ink on a Whisper White panel. I colored his hat with my Marina Mist Stampin’ Write Marker. I matted the panel on another piece of Whisper White and then Fast Fuse’d it into the card base and the card was done! …and then I added more of the Sweet Soiree Specialty DSP to the envelope flap. Et Voila! I may have taken a little artistic license with the colors of the Rainbow Builder Framelits rainbow – but I think you get the picture, right? I loved how the clouds got built up – all billowy and white! And how cute are those Pandas? Hope you like! Bannerized!🤣 😆 🤗 Great card. It looks so complicated! Great card! Those pandas are too cute! Love the embossing with the cloud layers👍 And who doesn’t like a little ROY G. BIV? Lol! Pretty sure I learned it in college – then I shared it with my middle school students😉 Hope I get to see you in Atlanta! This is so cute. The rainbow is wonderful. Great job, so much happening in one tiny package. I totally missed this Blog Hop last week. Was out of town a couple of days and that is what happens!! Anyway, love this card and will CASE it, probably today, as I have need of a birthday card for a 6 year old. And yes, ROY G BIV is older than dirt! However, I learned the colors backwards starting with violet and there is no word for that. Not sure what that says about MY brain!